3.5 stars for this sweet princess romance with dark undertones. 99c Kindle special as of July 2016.I really enjoyed the cute first book, Just Ella, so when this third one went on a special sale yesterday I bit, even though I haven't read the second. It's nominally fantasy, since we're in a made-up kingdom here, but nothing otherwise (magic, dragons, etc.) that would tag this as fantasy. The series deals with the royal family of Dalthia: the king and queen have about seven daughters, and Annette Larsen has written novels about the romances and adventures of four of the princesses so far.As we begin the story, Marilee has been shocked by the unexpected accidental death of her husband, the son of a duke in a neighboring country. The guy was an abuser, emotionally and physically, so Marilee can't be anything but profoundly relieved that he's dead and gone. She ships off his body to his parents and tells them to deal with his funeral, fires the servants who connived with and followed the orders of her husband to hurt and confine her (which was all of the servants except four), and sets about trying to rebuild her life and reclaim herself and her confidence. This is the story of that process. She's helped along by James, a kind, friendly and rather handsome neighbor, but the focus of this book is as much or more on Marilee's emotional recovery from spousal abuse, so you have to be down with this kind of a topic in your romance reading. Trust is a huge issue for Marilee, not only as it relates to James and other men, but with respect to herself as well. For a self-published book, this is well written; I didn't notice enough grammatical/punctuation errors to bother me.I think reading Saving Marilee would be cathartic for anyone who's lived through this kind of torture. The storyline is fairly simple and straightforward, but overall I enjoyed it, and kudos to Larsen for taking on such a sensitive topic in a sweet romance type of book. When I was done I thought to myself, so, who is saving Marilee? And I think the answer to that is, although Marilee has some very good friends who help her immensely, ultimately: Marilee saves herself. Ahhhhhh....... I love books like this. A beautifully written love story with good complex characters and good scenes between the main characters. A story that is believable and real. This series started out with a lighter subject books then this it is a little more serious then the other two. When dealing with the subject matter that is in this book it is hard to write a story that is not depressing. The author did a beautiful job of giving it the gravity it needed but not dragging the book down. I cared about Marilee from the very beginning and rooted for her all the way. I just LOVED James. there could not have been a more perfect man for Marilee:} If you loved this series find Julianne Donaldon and Sarah Eden. Two of my favorite Authors along with Annette:} This book is a proper romance with no religion. There is kissing but it is very clean. There is some references to violence, but mostly manipulation and emotional abuse by a spouse is talked about. 16 and up. Rarely do I give books 5 stars, most ones that I love are 4 stars. This one got to me. I bought this book on the knowledge that Annette K. Larsen's first two books Just Ella and Missing Lily were great reads. I loved it from start to finish. It was an intense emotions that makes your heart happy one moment and sad the next. I fell in love with James and he proved how amazing he was for Marilee and her situation. Fantastic job! I thoroughly enjoyed this. Marilee's story is more heartbreaking, but I was there pulling for her and cheering for her success. I ached for the painful way she was treated and the very real way that shapes her. I love her friendship with James - he is kind and thoughtful, without guile, relaxed and funny, confident but real. The love that springs up is the real thing. This story has deeper layers and is beautifully done. I love the support Marilee is given as she grabbles to put the pieces of herself back together, but not exactly the way they were before. It's ultimately her battle to face. But the journey back to herself is not lonely and made me love so many, and the sifting of truth is inspiring. I loved this story! I'm a huge fan of both of Annette Larsen's other books, but this one has something extra special and real about it. The author was able to tackle a serious issue without making Marilee's responses contrived or 'textbook.' This book is about healing and growing and learning to love. And PS, it's super romantic. Wow! This book gripped me from page one. The first sentence. Well written, great characters, deep feelings and real love. It was hard but that added to its charm, and its strength. Saving Marilee is not like Annette Larsen’s first two books. Well, let me amend that: it is like her other books—-full of romance and emotion, loveable characters and fantastic dialogue—-but it’s also more. It’s more emotional, more heartbreaking, and more triumphant. It’s more full of internal turmoil, real life dilemmas, and thoughtful moments. It’s a novel about what real love is, about trust, about healing. I loved the pacing of the romance, intermingled with Marilee’s personal healing and growth. I loved James, with his attentiveness and sensitivity mixed with teasing and fun. This novel has its own dynamic, a very ambitious one, and it totally works. This book was everything I hoped for and so much more! It was a beautifull story about a young women growing up and finding strength, healing, and love after domestic abuse. READ THE AUTHORS NOTE AT THE BEGINNING. I'm super picky when it comes to plot and character development and this author never lets me down! Marilee's story stands alone while still being perfectly intertwined with her sister's (in Just Ella, and Missing Lily). It feels raw, real and believable without being dark. I can't wait to read it again! It is so much more than just a beautiful love story. Annette K. Larsen has a writing style that is so enjoyable. This 3rd book did not disappoint. I loved James patience and understanding with Marilee. I also loved watching Marilee find herself, her strength, again. Being freed from an abusive relationship is hard. It's even harder if you don't have the love and support of family and friends... Beautiful story. I LOVED this book. I knew I would as I love all of this author's clean, romantic, regency books. This book is so well written. It is not all sunshine & rainbows & I teared up a few times at her pain & the trauma she endured. I was so happy for Marilee that she had such a kind, patient friend in James to help her find herself again. Recommend to everyone. Beautifully written. Annette Larsen has done it again!!! What a sweet and beautiful story- a girl who had been abused by the one who should have loved and protected her learns to trust again. Marilee's story was powerful and her emotions are so very real. A fantastic read I would recommend!!! I've enjoyed the princess stories from Annette Larsen--this one sharing a story much darker than the others but still good. The first thing anyone picking up this book should know is that though it's categorized as a historical romance, it is not historically accurate. I was a bit confused by the book when I started reading it, because I couldn't figure out what time period it was supposed to be, so I poked around in the author's website and discovered that she doesn't ascribe her writing to any specific time period. Though it's not a fantasy or sci-fi, it is a made-up world, so don't go into this expecting an accurate historical romance. It doesn't take place in modern times or on this world, but it's not historical or fantastical. It gets shelved as a historical romance, because that's the closest you can get to what the genre is. This book drove me crazy at first because of all those inconsistencies, but once I realized that the author is intentionally making up her own rules and culture (she borrows from various time periods and cultures), it didn't bother me anymore. So, go into this with eyes wide open.That being said, this is an entertaining read. Not amazing or memorable, but it was entertaining the first time around. It's a sweet (and squeaky clean) romance with a element of darkness to it as the heroine is struggling to overcome the emotional abuse she suffered during her marriage.My favorite thing about the story was that the author threw a couple curveballs at me with regards to the hero and villain. There were several times during the story where the heroine didn't know who the hero or the villain was and the author painted both of them good enough and shady enough that I felt just as confused as the heroine at times, so that was great.Unfortunately, there was a lot about the story that I just couldn't buy into. Mostly, it was the heroine and the amount of emotional scarring she had from her marriage. Her husband was a horrible person--no question. He was emotionally abusive and controlling and even hit her a couple times (the physical abuse is never really specified all that much, but the heroine does say she was hit a few times, though I never got the impression that physical abuse played a huge part of their relationship). However, they were only married nine months, the first of which was happy-ish and two or three of those he spent traveling. He was abusive and she would definitely have trauma attached to that, but the level of trauma she exhibited afterwards was a bit overly dramatic for the situation. Again, I'm not saying he wasn't a terrible person or what she went through wasn't horrible, but it's set up that she was this incredibly confident, effervescent person before she met him and yet in a period of only six months she reduced to a quivering mess that flinches and has panic attacks constantly. It just didn't feel realistic to me. I'm not downplaying the trauma that emotional abuse can cause, but I've known people in abusive situations and generally speaking, emotional abuse is something that takes longer to cause the level of damage she exhibited.I did like the fact that the book showed a different side of abuse that isn't as obvious or flashy as is portrayed in most fiction. She was locked in her room and was abused physically to a minor extent (she does carry a scar from one incident), but mostly, it was emotional in nature. It seems like in fiction when someone is abused, it's the extremely physical or sexual in nature.This is a decent story and it kept me entertained, but I just didn't think it was well thought out. 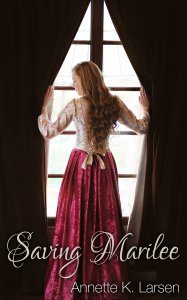 If you're interested in a historical romance featuring an abused heroine, I would check out Sarah M. Eden's "The Kiss of a Stranger" or "As You Are". I think both feature much more realistic characters and I liked them much more. I like the premise of this story. Starting off with her husband's death, Marilee finds she isn't sad at all. He was cruel to her and kept her imprisoned in her room often and changed her colorful and happy wardrobe with high collars and stiff necks on plain colored clothing. He took away her vitality. He took the letters written to her and from her and hid them. This book demands to be read and find that life isn't always happily ever after in marriage. And those times were probably the worst. But there is always a silver lining waiting.Right away, she fires all the staff who kept her locked up. She burns her husband's furniture she bought for him. She decides to learn to do things on her own. But in those times, it wasn't always possible. Her neighbor, James, came to offer his service to help in any way. Marilee wasn't trusting and enjoyed her new found freedom and solitude. Yet, she started to enjoy his company as well. James is so sweet and caring and very kind and although it is easy for the reader to see his love for her start to shine, she can't. James will do whatever it takes and however long it takes to gain her trust and love. He isn't perfect as none of us are. But James is definitely a gentleman and a hero. I just sigh whenever he is in the room! !Marilee tries to navigate her way through all the legal and societies expectations to find her way back to the happy person she was before even though she has forever changed by her past circumstances. You will fall in love and you will root for Marilee and James and for Marilee to find herself again.I love this series! I have waited anxiously for a long time to read “Saving Marilee” by author Annette K. Larsen. Her first two were “Just Ella” and “Missing Lily”. Both books were outstanding and this third installment of their sister, Marilee is equal to those. Annette Larsen takes a sensitive and brave approach to a very difficult subject - spousal abuse. Even though the story is fictional, including the fictional “country” the princess sisters come from, there must be a lot of truth in this plot. IMO, it is beautifully handled and the story is compelling. It’s a journey of recovery for young bride, Marilee, who was completely surprised by the traumatic situation she found herself in. Saving is truly the correct description and her recovery is full of courage and love.I loved how we readers are brought into Marilee’s head to understand the drama she endured. The first page grabbed my attention and didn’t let go until the happy end. Marilee’s journey to regain her life, her personality, her feelings, her independence, her courage, and most of all her trust in human beings was remarkable – and beautifully written. I highly recommend all three of Annette Larsen’s books and will buy – yes, even pay full price for anything she writes. I would not hesitate to let any teen girl read any of these books. In fact, I think it would be a good thing to add such sensitive knowledge to that particular age group. (If you hesitate, then read it yourself first. )Well done yet again, Annette Larsen! You join a couple other authors at the top of my Favorites List! My only suggestion: write more!! I think I would actually give this book 4.5 stars. I really enjoyed it. I don't usually like "dark" themed books but there was enough light from surrounding characters that the mature theme of spouse abuse wasn't overwhelming. I was fascinated by the story. I wondered at how quickly she was able to begin trusting a man again but I've seen it happen in real life so I guess it does happen. The recollections about the abuse were horrifying since there was no way out of it. One might think "stand up for yourself" but her husband had arranged things so neatly that taking a stand actually made things worse. I could find no way she could have made things better since trying to leave was unsuccessful. I was glad that it was all recollections instead of happening during the book. (The husband has just died as the book opens). I felt empathy for Marilee through out but it was actually the servants and neighbor James, as well as his mother (and the dog) that I really loved in this story. I loved that the servants were able to assist her in their subservient roles giving her support and love even through the abuse and it seems that all of these characters were able to foresee what her needs were before she knew it herself. I felt relief that they could help her when I couldn't help her myself if that makes any sense. I enjoyed the other books about her sisters as well but I think this was my favorite. I loved this book so much! It had my attention from the beginning and had my heart pounding for Marilee the entire book. James is, well, perfect. There is no other way to describe him. I feel like one of Annette K Larsen's biggest talents is making you fall in love with the hero! I would very much recommend this book to anyone who likes Time Period pieces (especially regency, although this book is NOT a specific time period or even in our world, it tends to follow the same general rules). I also LOVE the moral character of her heroines, and I know she talks about that in the back of all of her books but it is something that is so important to me and I feel she does a perfect job making them moral and yet realistic. Thank you so much Annette for writing three wonderful books that I can just fall into on a cold day with my hot chocolate!! I can't wait to read your next novel! As with the last book in the series, I really enjoyed the first half of this book. It was easy to get into and kept my attention. However, I found myself skimming the last few chapters because it all seemed so mushy and repetitive. I also have a hard time believing that she was only married for eight months. It seems to me that her marriage would have had to been longer for all the abuse to sink in as it did. Super good book. I can not believe what she went through. What a horrible situation. James was pretty awesome and I loved the dog. Probably closer to 4. Quick good read. I will read her books. Saving Marilee was quite a serious and somber read as this book deals with the difficult subject of abuse. Because of the subject matter, some scenes were difficult to read, especially Marilee's flashbacks of her horrible marriage. Despite this, the story is still full of sweetness and hope. Saving Marilee was primarily about Marilee’s journey of healing from her abusive marriage, rediscovering herself, and learning to trust again. It was so satisfying watching her gradually save herself as she put herself back together and allowed herself to give her heart to James as their friendship slowly deepens. I loved the message that we can emerge from our difficult experiences to grow and become something better, despite our trials. I thought the characters were well-developed. I liked both Marilee and especially sweet James. I loved how their relationship began as friendship as James offered his support to Marilee, and from there, their relationship developed into a sweet romance. Despite them being a cute couple, I love Ella and Gavin from Just Ella more and found their relationship more developed. It was so fun seeing them make a reappearance in this story, along with Lylin and Rhys from Missing Lily. Like the author’s previous books, the romance was very cute and sweet, and my reading experience quite enjoyable, but the entire story's more serious tone kept me from loving it as much as the others in the series. This romance is one of healing. Marilee’s horrific, abusive marriage ends after 7-8 months when her husband is struck down in a tragic accident. But now she must discover who she is, after being lost under her husband’s heavy hand and abusive tricks to make her lose her identity. When she meets her kind neighbor, Gavin, she finds it hard to trust him. She wonders if she’ll ever be able to trust a man ever again. I really enjoyed this journey with Marilee in regaining her identity after her horrible marriage. There was anguish, sweetness, tender scenes, angry scenes. And a great villain thrown into the mix to keep me guessing. This was super well done, as this whole series has been so far with the princesses of Dalthia. I enjoy this author’s writing style. I am really l loving this author. This book had been sitting in my Amazon save for later basket for some time, so I was thrilled when I realized I could get it on Kindle Unlimited. And I am just eating up this series. The books have been really hard to put down. A+ for technical readability–there have been very, very few typos or grammatical errors. And kudos also for making me want to keep reading the story. This was a gentle read about a really tough subject. There were several characters I loved, especially Rogue. I also liked that the parents seem more available in this one. And I really appreciated that, while there is a very sweet romance here, ultimately (as another reviewer pointed out) Marilee saves herself. WOW. This is where the Dalthia series really took off for me. I felt that this book was a huge leap forwards from the first two. The romance took longer to develop, which was good, as it was done so believably and beautifully and there was no frustrating long wait for resolution as in the first two books. I loved Marilee's character and really felt for her and enjoyed watching her blossom and heal. James was such a lovely character, tender and sweet as he waited for and gently assisted in Marilee's healing. Characterisation was nuanced and sometimes you weren't sure what to think about certain characters, in an interesting, realistic way. HUGE thumbs up!! Loved it! This author is fabulous! The writing like medicine to my soul! Marilee, the character in the book is strong and vibrant in the beginning, but a domineering husband breaks her and she struggles and fights to come back to herself along with the help of a handsome and caring neighbor, James! Their interactions are just butterfly's. " my books are about woman who face hard choices, who face pain and rejection and often have to face the reality of sacrificing what they want for what is right. The consequences are often difficult or unpleasant, but in the end, doing what's right will always be worth it. " she is clean and oh so good! Saving Marilee tells the story of Princess Marilee who married a prince from a neighboring kingdom and finds that he is abusive and controlling. The story opens just after the Prince's death and tells the story of her recovery. It may be a true accounting of how abuse affects a person, but it was a little heavy. I DID appreciate the introspection that Marilee engages in, that is instructive for all of us. It is a fun book, but not all fluff. This is one of the heavier books in this series, but Annette Larsen handles it so well. You literally ache for Marilee as Annette portrays her emotions and upheaval so beautifully, but you can see her road to finding herself again will be just as beautiful.